The automatic tire inflation system market is estimated to be US$ 988.6 million in 2017 and is estimated to reach US$ 2,029.9 million by 2025. The global automatic tire inflation system market is experiencing an intense growth with regards to the investments, trials being carried out and deployment for future in the current scenario and is anticipated to rise exponentially in the coming years. The various stakeholders in the automatic tire inflation system ecosystem are involved in the end-to-end development of automatic tire inflation system technology and ensure that the best product and services are made available for the consumer. These stakeholders work in accordance with the emerging regulatory compliances across the globe. Strategic partnerships between manufacturers, equipment vendors, and concerned authorities are anticipated to enable huge growth in the market for automatic tire inflation system over the forecast period. The automatic tire inflation system market is anticipated to grow at a CAGR of 9.7% between 2018 and 2025. The demand for commercial vehicles has significantly increased over the years. Simultaneously, with the increase in demand for vehicle production, the requirement for technologies that optimizes the fuel efficiency of vehicles is also been experienced by the vehicle manufacturers and component/accessories manufacturers. The fuel efficiency depends upon various factors such as engine performance, distance traveled, and also tire condition. Underinflated tires create a larger surface area between the road or ground and tire, thereby enhancing the smoother maneuverability. However, this results in an increase in resistance power of rolling tires, which not only reduces fuel economy but also wears out the tires. Continuous monitoring and correcting the tire pressure helps in ensuring optimum vehicle performance. The customers of every vehicle segment look for fuel-efficient vehicles and owing to this, the vehicle manufacturers are increasingly integrating automatic tire inflation system on the vehicles in order to meet the demand of their customers. This factor is bolstering the growth of the market for automatic tire inflation system in the current scenario. The fuel efficiency of the vehicles decreases over the years depending upon the usage. 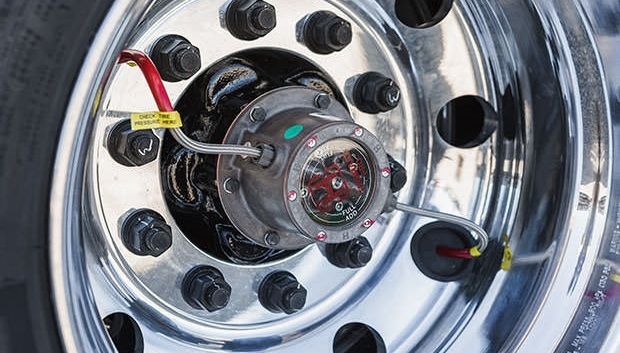 Owing to the increased focus on fuel efficiency among the end users of commercial vehicles, automatic tire inflation system market is anticipated to benefit in the coming years. This is due to the fact that, the users of existing commercial vehicles are increasingly opting for retrofitting their vehicles with automatic tire inflation system in order to reduce their maintenance costs, increase tire lifespan and enhance fuel efficiency. The substantial increase in adoption of retrofitting the vehicles with this advanced technology, the market for the same is experiencing a steady growth in the current scenario, and the trend is anticipated to pave the path for automatic tire inflation system market in the forthcoming years. Some of the major players influencing automatic tire inflation system market are PressureGuard, Haltec Corporation, Aperia Technologies, Inc., Continental AG, and Dana Limited. Also, Michelin, STEMCO Products Inc., Tire Pressure Control, Meritor, Inc., and Hendriksson USA, LLC are other key companies in the automatic tire inflation system market.